To support and promote the libraries and recreation centers across the County by rotating the program at different locations. 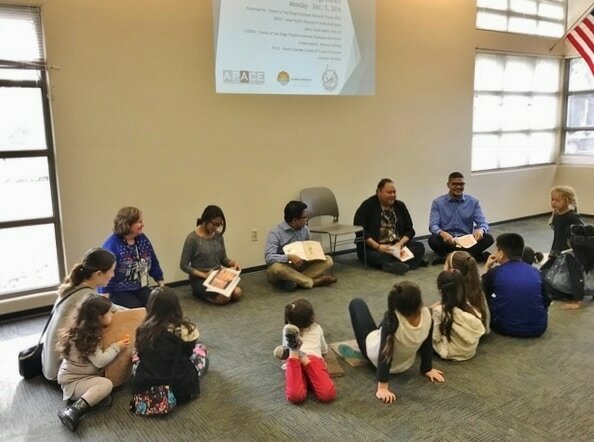 Storytelling – Participants (children and families) will listen to a story-teller read books that focus on diversity and culture. For further learning and exploration of topics, participants will be encouraged to ask questions and discuss the book. If so desired, participants may also read part of or the entire book to the group. By encouraging reading and discussion, participants will develop their literacy and verbal skills. Learning Culture through Dance and Song – Participants will learn enjoy physical exercise through cultural dances and also learn cultural songs. We will teach basic concepts of rhythm and movement, while also showing different historical and social cultures. Games – Participants will engage in cultural games that require some physical activity to introduce options away from video and computer games. Contact csdfea@sdcounty.ca.gov if you are interested in volunteering.